This Premier Easton Thermostatic Shower Panel features an integral swivel shower head, six body jets and a slimline handset. 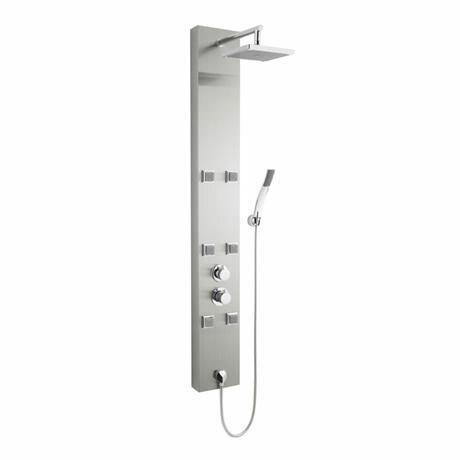 The attractive angles of this modern thermostatic shower panel will be the centrepiece of your bathroom - and deliver a superb shower. "Stylish, easy to fit and has the facility to be easily repairable in the future if necessary. This unit has the advantage of being simple - my previous model was to complex to repair without replacement. The new unit also was wide enough in the body to cover the pipework and fixings into the wall tiles from my previous shower without any holes or disfigurement showing. I am totally happy with this shower, which has a good flow, regulates temperature well and has all the features I wanted."